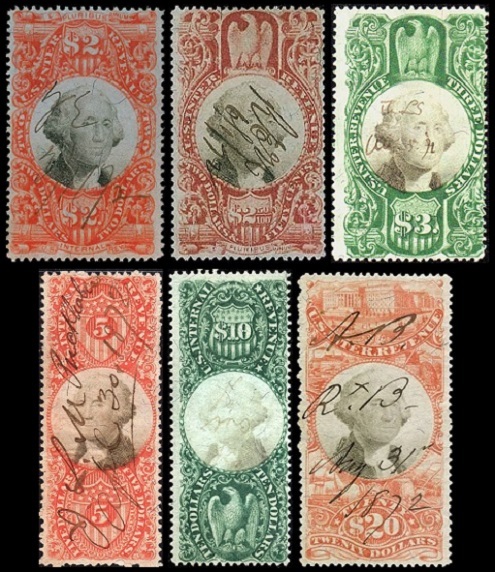 The Third Issue of US revenue stamps was produced between 1871 and 1874. Shortly after the appearance of the Second Issue, there was a lot of confusion resulting from the fact that all but the two highest denominations of the Second Issue were printed in the same colors. To alleviate the situation, the Department of Internal Revenue ordered that some of the denominations of the Second Issue be printed in differing colors. These new stamps are referred to as the Third Issue. These new revenue stamps were also printed on a "chameleon" paper with silk fibers, which usually has a violet or pinkish tint. 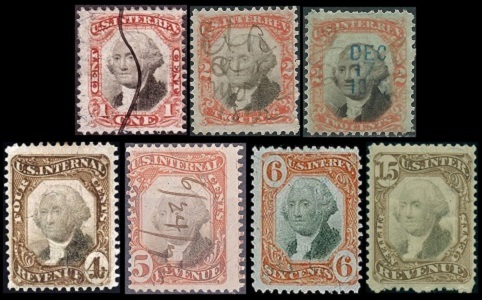 The most common types of cancellations on these Third Issue revenue stamps are circular or herringbone cut-cancels. Hand-stamped and manuscript cancels are worth more. The 2 C., 5 C., 15 C., 30 C., 1 D., and 2.50 D. denominations of these stamps exist with inverted centers. The 2 C. denomination stamps with inverted centers, though still pretty expensive, are common. The other denominations are rare, and they are seldom seen outside of major auction sales. There are also forgeries of these inverted center revenue stamps. These inverted center stamps should ONLY be purchased with a certificate of authenticity. The new US revenue stamp design shown above, at the left, was first issued in 1875. These new revenue stamps were printed on bluish, unwatermarked paper, perforated 12, and they all featured an allegorical representation of Liberty. During 1878, the printers began using a new paper with a double-lined USIR watermark. This new revenue stamp watermark would continue in use until 1958. During 1881, new varieties began to appear that were rouletted 6, instead of the usual perforation 12. An example is shown above, at the right. 02 C. (1875 - Unwatermarked - P 12 - Sc. #R152a) - Blue on Bluish. 02 C. (1878 - Watermarked - P 12 - Sc. #152b) - Blue on Bluish. 02 C. (1881 - Watermarked - R 6 - Sc. #152c) - Blue on Bluish. 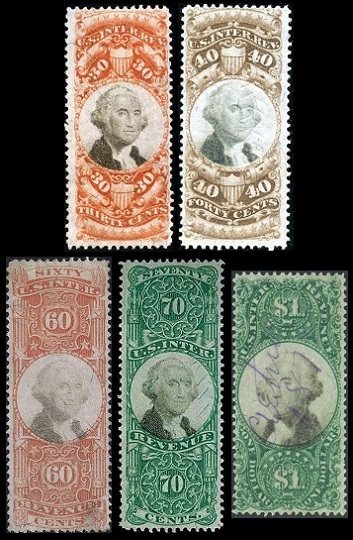 These would be the last of the general purpose U.S. Internal Revenue stamps for various types of taxable paper documents. These stamps would be replaced by a new series of US revenue stamps, inscribed DOCUMENTARY, during 1898. The Documentary stamps would continue in use through 1962, and stamps required for other types of taxation would spawn many new categories of US revenue stamps.